Every day this month we’ll be showcasing one of the artist and authors in the new ‘Art of Sherlock Holmes’ project – today it’s artist Bruce Helander. Bruce Helander is an art critic, arts writer, curator and artist whose speciality is collage and assemblage. He has a master’s degree in painting from the prestigious Rhode Island School of Design, where he later became the Provost and Vice President for Academic Affairs of the college. He is a former White House fellow of the National Endowment for the Arts and has won the South Florida Cultural Consortium fellowship for professional achievement in the visual arts. He is one of two 2014 inductees to the Florida Artists Hall of Fame, Florida’s most prestigious arts and culture honour (the other is musician Tom Petty). His work is in over fifty museum collections, including the Metropolitan Museum of Art, Solomon R. Guggenheim Museum, Brooklyn Museum, Smithsonian, Art Institute of Chicago, Los Angeles County Museum of Art, San Francisco Museum of Modern Art, Whitney Museum of American Art and Museum of Contemporary Art (MOCA) in Los Angeles. “If there was a Pulitzer Prize for collage, Helander would surely win it.” Kenworth Moffett, former director, Museum of Art, Fort Lauderdale. 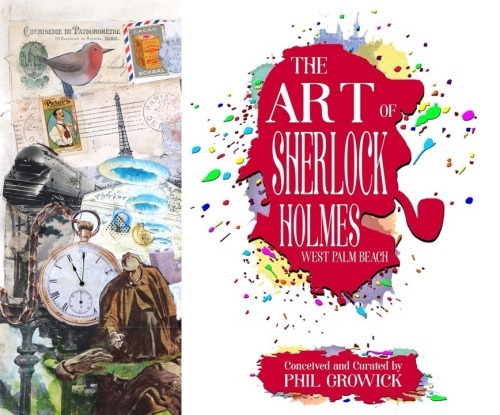 The Art of Sherlock Holmes West Palm Beach Edition is published in May and available now on Kickstarter – The Art of Sherlock Holmes.